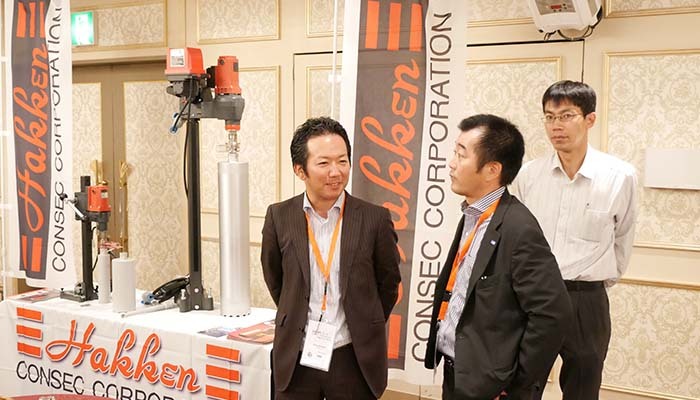 The company was an exhibitor in the last IACDS Annual Convention 2018, held on May 21-23, in Tokyo (JAPAN). HAKKEN is a manufacturer of construction machinery and diamond tools, which has been developing business in various countries around the world and plays an active role in civil engineering and construction sites. Its sales engineer is always trying to catch the technical needs arose at the job site which is timely informed to the R&D department and being one of the ideas to develop a new machine. And furthermore, contractor department also requires the solution to complete daily construction job effectively to R&D department which helps new machine concept. R&D department develops and manufactures the various machines to meet the new requirement from the customer. And they deliver not only the machine but also the technical know-how to complete never experienced construction work cooperating with contractor department. HAKKEN is a brand of CONSEC CORPORATION. CONSEC CORPORATION was established in 1967, and it is one of the Japanese leading manufacturers of machines and tools for concrete coring, wall sawing, and wire sawing. Its products are accumulated so much technical know-how for half a century. In addition, the company has a contractor department in the house and feedback the product reliability and demand from the user point of view in order to endlessly improve the machine and find the new innovative ideas. The mission of CONSEC CORPORATION is to contribute to the prosperity of society by creating innovative product and brand-new technology in the building and civil engineering market heeding safety and environment.